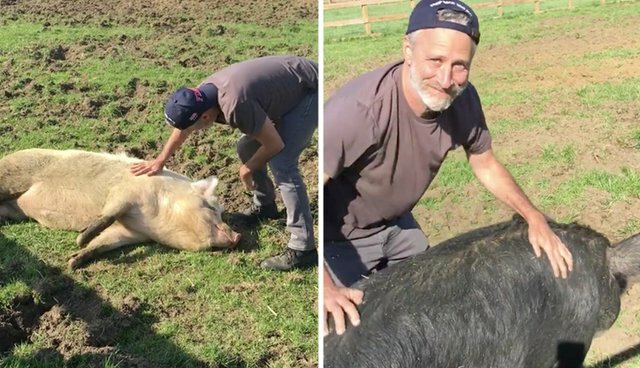 It's been months since Jon Stewart stepped out of the limelight as host of The Daily Show to run a farm sanctuary with his wife Tracey. But while there's little glamour in that new role as rescuer, we've never seen him look happier. If there's one reason all three seem extra pleased, it might be because they nearly never met at all. The Stewarts welcomed Anna and Maybelle onto their farm last year after they were found on a roadside, likely having fallen from a transport truck on the way to be slaughtered. Now, the Stewarts say, the pigs are part of their family - and we couldn't be happier for them all.